Temps in the mid-50s in January coupled with the news that 2012 was the hottest ever in the US has put us in the mood for a little summertime music. 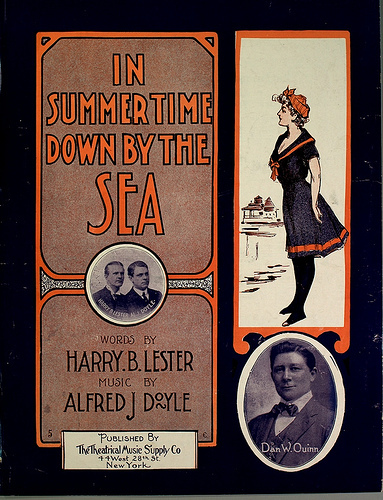 “In Summertime Down by the Sea” was sung by the successful early recording artist Dan W. Quinn in 1904, when Dreamland was brand-new and Luna Park was just one year old. “The splendid new summer song. Don’t fail to get it for your act,” said an ad in The New York Dramatic Mirror. The Columbia black wax cylinder record is played on a 1901 Columbia Model AB Graphophone. Both are from the collection of Victrolaman, whose 1920s recording of the Mills Brothers “Coney Island Washboard Roundelay” was previously featured on ATZ. Victrolaman’s YouTube channel features recorded sound from the 1890s up to the mid-1930s played on the original gramophones & phonographs of that era. Love the graphics and lettering on the sheet music! I would enjoy seeing more of the collection.